For other uses, see Kingdom of Heaven (disambiguation). Stained glass by Hallward depicting Matt 5:10: "Blessed are the poor in spirit: For theirs is the Kingdom of Heaven". 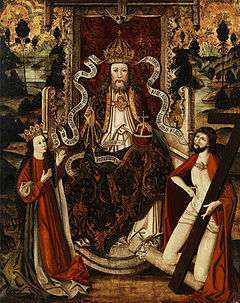 The concept of the kingship of God appears in all Abrahamic religions, where in some cases the terms Kingdom of God and Kingdom of Heaven are also used. The notion of God's kingship goes back to the Hebrew Bible, which refers to "his kingdom" but does not include the term "Kingdom of God". Also, a Kingdom of the Gods is common in paganism such as Mount Olympus in Greek mythology or the phrase King of the Gods. The "Kingdom of God" and its possibly equivalent form "Kingdom of Heaven" in the Gospel of Matthew is one of the key elements of the teachings of Jesus in the New Testament. Drawing on Old Testament teachings, the Christian characterization of the relationship between God and humanity inherently involves the notion of the "Kingship of God". The Quran does not include the term "kingdom of God", but refers to Abraham seeing the "Kingdom of the heavens". However, Bahá'í writings do use the term "kingdom of God". The term "kingdom of God" does not appear in the Hebrew Bible, although "his kingdom" and "your kingdom" are sometimes used when referring to God. "Yours is the kingdom, O Lord" is used in 1 Chronicles 29:10-12 and "His kingdom is an everlasting kingdom" in Daniel 3:33, for example. "The Hebrew word malkuth [...] refers first to a reign, dominion, or rule and only secondarily to the realm over which a reign is exercised. [...] When malkuth is used of God, it almost always refers to his authority or to his rule as the heavenly King." The "enthronement psalms" (Psalms 45, 93, 96, 97-99) provide a background for this view with the exclamation "The Lord is King". 1 Kings 22:19, Isaiah 6, Ezekiel 1 and Daniel 7:9 all speak of the Throne of God, although some philosophers such as Saadia Gaon and Maimonides interpreted such mention of a "throne" as allegory. The phrase the Kingdom of God isn't common in intertestamental literature. Where it does occur, such as in the Psalms of Solomon and the Wisdom of Solomon, it usually refers "to God's reign, not to the realm over which he reigns, nor to the new age, [nor to ...] the messianic order to be established by the Lord's Anointed. The term does occasionally, however, denote "an eschatological event," such as in the Assumption of Moses and the Sibylline Oracles. In these cases, "God's Kingdom is not the new age but the effective manifestation of his rule in all the world so that the eschatological order is established." Along these lines was the more "national" view in which the awaited messiah was seen as a liberator and the founder of a new state of Israel. The Gospel of Luke records Jesus' description of the Kingdom of God, "The kingdom of God does not come with observation; ... For indeed, the kingdom of God is within you." The Apostle Paul defined the Kingdom of God in his letter to the church in Rome: "For the kingdom of God is not a matter of eating and drinking, but of righteousness, peace and joy in the Holy Spirit." In the Gospels, especially the Synoptic Gospels, Jesus speaks frequently of God's kingdom. However, Jesus never defines the concept. "He assumed this was a concept so familiar that it did not require definition." Karen Wenell wrote, "Mark's Gospel provides for us a significant place of transformation for the space of the Kingdom of God, precisely because it can be understood as a kind of birthplace for the Kingdom of God, the beginning of its construction ...". The Kingdom of God (and its possibly equivalent form Kingdom of Heaven in the Gospel of Matthew) is one of the key elements of the teachings of Jesus in the New Testament. Drawing on Old Testament teachings, the Christian characterization of the relationship between God and humanity inherently involves the notion of the "Kingship of God". Most of the uses of the Greek word basileia (kingdom) in the New Testament involve Kingdom of God (or Kingdom of Heaven). Matthew is likely to have instead used the term heaven because the background of his Jewish audience imposed restrictions on the frequent use of the name of God. However, Dr. Chuck Missler asserts that Matthew intentionally differentiated between the kingdoms of God and Heaven: "Most commentators presume that these terms are synonymous. However, Matthew uses Kingdom of Heaven 33 times, but also uses Kingdom of God five times, even in adjacent verses, which indicates that these are not synonymous: he is using a more denotative term." Kingdom of God is translated to Latin as Regnum Dei and Kingdom of Heaven as Regnum caelorum. The Old Testament refers to "God the Judge of all" and the notion that all humans will eventually "be judged" is an essential element of Christian teachings. Building on a number of New Testament passages, the Nicene Creed indicates that the task of judgement is assigned to Jesus. No overall agreement on the theological interpretation of "Kingdom of God" has emerged among scholars. While a number of theological interpretations of the term Kingdom of God have appeared in its eschatological context, e.g. apocalyptic, realized or Inaugurated eschatologies, no consensus has emerged among scholars. R. T. France points out that while the concept of "Kingdom of God" has an intuitive meaning to lay Christians, there is hardly any agreement among scholars about its meaning in the New Testament. Some scholars see it as a Christian lifestyle, some as a method of world evangelization, some as the rediscovery of charismatic gifts, others relate it to no present or future situation, but the world to come. France states that the phrase Kingdom of God is often interpreted in many ways to fit the theological agenda of those interpreting it. In the New Testament the Throne of God is talked about in several forms. Including Heaven as the Throne of God, The Throne of David, The Throne of Glory, The Throne of Grace and many more. The New Testament continues Jewish identification of heaven itself as the "throne of God", but also locates the throne of God as "in heaven" and having a second subordinate seat at the Right Hand of God for the Session of Christ. The term "kingdom of God" does not occur in the Quran. The modern Arabic word for kingdom is mamlaka (المملكة), but in the Quran mul'kan (مُّلْكًا), refers to Heaven, e.g. in 4:54 "Or do they envy mankind for what Allah hath given them of his bounty? but We had already given the people of Abraham the Book and Wisdom, and conferred upon them a great kingdom" and 6:75 "Thus did We show Abraham the kingdom of the heavens and the earth." The term "kingdom of God" appears in the writings of the Bahá'í Faith, including the religious works of Bahá'u'lláh, the founder of the religion, and his son `Abdu'l-Bahá. In the Bahá'í teachings, the kingdom of God is seen both as a state of individual being, and the state of the world. Bahá'u'lláh claimed that the scriptures of the world's religions foretell a coming messianic figure that will bring a golden age of humanity, the kingdom of God on earth. He claimed to be that figure, and that his teachings would bring about the kingdom of God; he also noted that the prophecies relating to the end times and the arrival of the kingdom of God were symbolic and referred to spiritual upheaval and renewal. The Bahá'í teachings also state as people perform good deeds they become closer to God spiritually, so that they can attain eternal life and enter the kingdom of God while alive. 1 2 France, R. T. (2005). "Kingdom of God". In Vanhoozer, Kevin J.; Bartholomew, Craig G.; Treier, Daniel J.; Wright, Nicholas Thomas. Dictionary for Theological Interpretation of the Bible. Grand Rapids: Baker Book House. pp. 420–2. ISBN 978-0-8010-2694-2. 1 2 Bahá'u'lláh (2002). Gems of Divine Mysteries. Haifa, Israel: Bahá'í World Centre. p. 9. ISBN 0-85398-975-3. ↑ George Eldon Ladd, The Presence of the Future: The Eschatology of Biblical Realism, Eerdmans (Grand Rapids: 1974), 46–47. ↑ George Eldon Ladd, The Presence of the Future: The Eschatology of Biblical Realism, Eerdmans (Grand Rapids: 1974), 130. ↑ George Eldon Ladd, The Presence of the Future: The Eschatology of Biblical Realism, Eerdmans (Grand Rapids: 1974), 131. 1 2 George Eldon Ladd, The Presence of the Future: The Eschatology of Biblical Realism, Eerdmans (Grand Rapids: 1974), 45. ↑ Wenell, Karen (August 2014). "A Markan 'Context' Kingdom? Examining Biblical and Social Models in Spatial Interpretation". Biblical Theology Bulletin. 44 (3): 126. ↑ William Barclay The Gospel of Matthew: Chapters 11-28 p340 Matthew 23:22 "And whoever swears by heaven swears by the throne of God and by him who sits upon it." ↑ Philip Edgecumbe Hughes A Commentary on the Epistle to the Hebrews p401 1988 "The theme of Christ's heavenly session, announced here by the statement he sat down at the right hand of God, .. Hebrews 8:1 "we have such a high priest, one who is seated at the right hand of the throne of the Majesty in heaven")"
↑ Bahá'u'lláh (1976). Gleanings from the Writings of Bahá'u'lláh. Wilmette, Illinois, USA: Bahá'í Publishing Trust. p. 86. ISBN 0-87743-187-6. ↑ Bahá'u'lláh (1992) . The Kitáb-i-Aqdas: The Most Holy Book. Wilmette, Illinois, USA: Bahá'í Publishing Trust. ISBN 0-85398-999-0. ↑ `Abdu'l-Bahá (1908). Some Answered Questions. Wilmette, Illinois, USA: Bahá'í Publishing Trust (published 1990). p. 58. ISBN 0-87743-162-0. ↑ Momen, Moojan (2004). "Baha'i Faith and Holy People". In Jestice, Phyllis G. Holy People of the World: A Cross-cultural Encyclopedia. Santa Barbara, CA: ABC-CLIO. ISBN 1-57607-355-6. ↑ Smith, Peter (2008). An Introduction to the Baha'i Faith. Cambridge: Cambridge University Press. pp. 118–119. ISBN 0-521-86251-5. Selman, Martin J. (1989). "The Kingdom of God in the Old Testament" (PDF). Tyndale Bulletin. 40 (2): 161–83.